Most of my week-long, quickfire, Terrapin Brewing Company tasting notes will focus on their more extreme offerings. But today, we’ll take a look at one of their year-round beauties…the Hopsecutioner. Regular readers will remember that I put the Hopsecutioner on my list of top beer misnomers. Its 78 IBUs certainly make it a hoppy brew, but it’s such a carefully balanced IPA that the name Hopsecutioner is woefully inaccurate. I can’t really fault the folks at Terrapin for using it…it’s a slick name and admittedly the hops are the star of the show. But as I noted in my previous post, a beer called the Hopsecutioner should drag you out of the bitter bar, throw you in a bitter burlap sack, drive you to the bitter boondocks in a bitter Buick, and bitterly beat you to a bloody, bitter pulp with a bitter baseball bat (made of bitter Birch). Does the Hopsecutioner do all that? Of course not…who drives a Buick these days? The nose is far hoppier than your typical IPA, though again, not as hoppy as something called the Hopsecutioner should be. While there are a variety of strobiles in this bad boy, the dry-hopped, citrusy Cascade (the major aromatic in Sierra Nevada Pale Ale) is the most dominant. As noted earlier, the hops don’t drown out the other facets of the beer and there are plenty of fruity ester notes and a well-rounded pale malt profile. This is a true “single” IPA. The taste is jam-packed with lots of citrus notes…orange, grapefruit, and papaya all of which stem from the wide assortment of hops. There’s also a toasted, bready malt background that balances the bitterness while adding almost no sweetness to the proceedings. Where the hops do most of their dirty work is in the aftertaste…the bitterness lingers LONG after each sip. The mouthfeel is fairly rich for an IPA and not as drying as you would expect considering the hop profile. It’s medium-bodied and actually a bit creamy. Not to beat a dead horse, but rather than being Hopsecuted by the beer, I found the drinkability to be somewhat high. Even at 7.2%, you could conceive of this as a session IPA when a refreshing brew is desired but you still wanted a reasonably-bodied beer. 3 Hops for the Hopsecutioner…name notwithstanding, this is a tasty brew and I’m glad I can grab a sixer of it year-round. 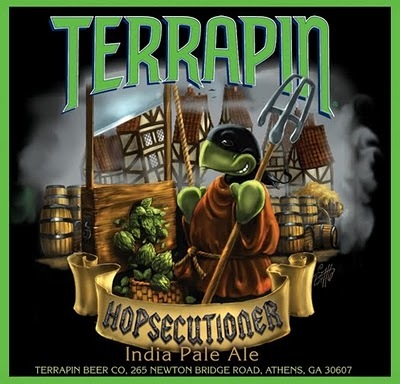 Posted in Tasting Notes.Tagged Hopsecutioner, IPA, Terrapin. Had to point out that I tried the Hopsecutioner the other night, courtesy of a pony express run from Brother Barley. Like the good Brother said, I left with a feeling of being less than Hopsecuted but I quite enjoyed the brew. The label actually points out that it’s a well executed beer with a good hop presence (Total paraphrase there), and that the execution points to good quality rather than death. Enough jibberish, I liked it and it tasted good. Nuff’ said. Loved the draft Hopsecutioner, but the bottled beer was a disappointment. Maybe my expectations were too high after the draft.